New Chrome Slant Chair features fine chrome frame on casters. Choice of upholstered back or back less. Offered in many colors. See alternative chrome sled base option. 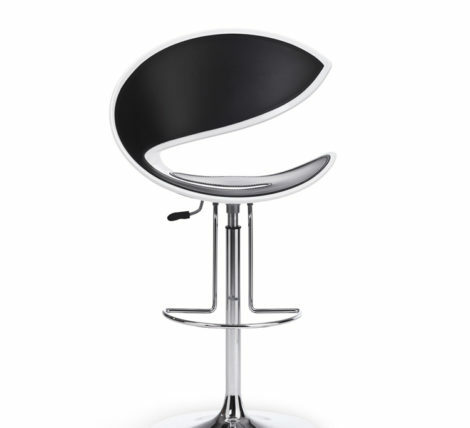 Also available as a barstool and counter stool. New for spring 2016. The New Chrome Slant Chair is also available with a metal sled base. The cantilevered base style chairs are great to sit in. As you sit in the chair the cantilevered base gives and moves with you to make a smooth entrance on to the chair. It’s a slight springy action that is extremely comfortable. This chair model is on our radar because it looks different and stands out. It has a wonderfully clean modern slim profile. It’s also available as a bar and counter stool perfect for standing height tables. Upholstery offered comes in many colors including fabric, faux leather and leather. For conference rooms faux leather is superb way to go offering higher industry rub rates which means longevity and durability. Faux leather is much easier to remove pen marks from than real leather or fabric. Use these chairs for conference and meeting tables, collaborative tables, dinning tables and home offices. Allow about 8 -9 weeks for delivery. All chairs are built to order. Premium quality designer chairs.